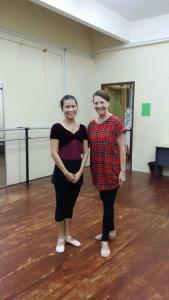 Ms Prangvalai Cooper a Thai ballet teacher who hails from Chaingmai visited with us at Aurora from 12th October to 15th October 2014. She took lessons from Ms. Carol Ainsworth Woods and Suhaili Michleine in preparation for the ISTD Imperial Ballet Licentitate exam in November. Our grade 6 students had the privilege to be taught by Ms Pang as she is fondly known by. We wish her every success! !